A good sear on the outside, slightly crispy, then inside was still moist and packed with crab meat. Not much filler in there, which was good. 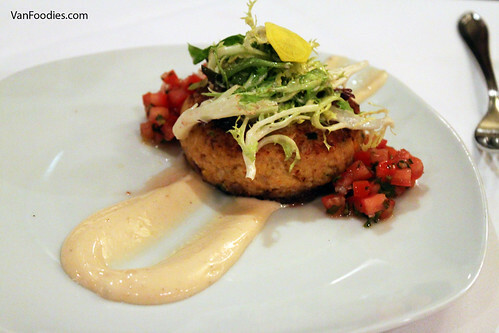 The tomato salsa was a good pairing, with a little tartness as well as natural sweetness from the fruit. 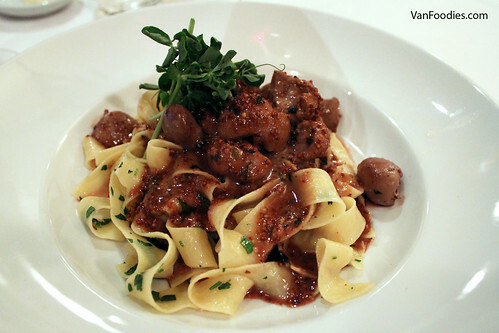 For entree, Mr. ordered the day’s special, Veal Kidney with Pappardelle. There were many kidney pieces on the plate, all seasoned and cooked well. I would imagine it’s easy to overcook the kidney, but it’s tender and not chewy at all. 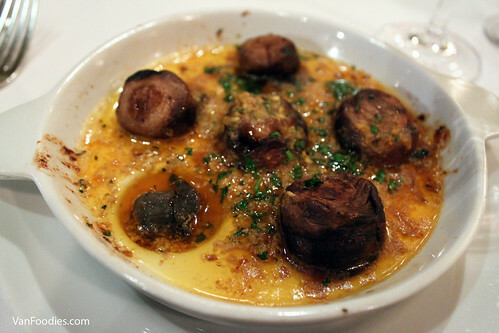 I never had veal kidney before; the flavour and texture reminded me of pork liver, not as grainy and gamey. The pasta was cooked just right, al dente with a bit of a bite. The grainy mustard sauce added some acidity to the dish, which helped cut through the richness of the kidney pieces. A seemingly simple dish but there was a lot of technique required to do it right. 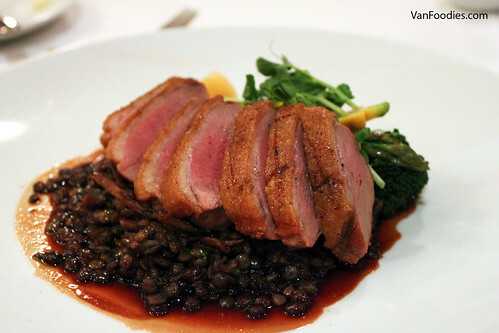 Mama Lam’s Brome Lake Duck Duo had a generous portion of duck breast. For whatever reason we expected just a few pieces but we basically got a whole breast! The skin was rendered well, not greasy at all; it had a hint of smokiness, and the meat was slightly pink, tender and juicy. Lentils were cooked through and had great flavours mixing with the duck confit. We just wish there was more of the shredded duck meat. As it stands, it’s more like a duck breast dish than a duck duo. 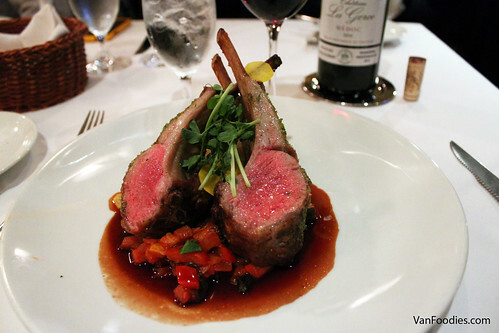 Papa Lam’s Herb Crusted Lamb Rack were cooked to a perfect medium rare as ordered. Portion size was quite generous with three thick-cut chops. The meat was juicy and flavourful; the ratatouille had nice flavours with a mix of peppers, zucchini and eggplant, somehow reminded me of a Chinese sweet and sour sauce (I know, I don’t get it either!). Lastly, my Veal Osso Bucco was just one sumptuous dish! The meat was fork tender with a little fatty bits, the sauce was rich and flavourful. The fried polenta pieces were crispy outside and creamy inside – that’s the best and only way to eat polenta. The bone barrow, yes, bone barrow, added extra fat and a layer of flavour that you could only find in this unhealthy goodness. 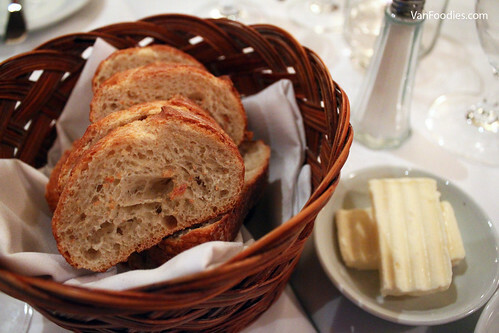 I only wish there was some bread left (Papa Lam has finished the 2nd basket of bread by this point!) for me to eat it with! As you can probably imagine, after two rounds of rich and delicious plates, and two baskets of warm bread, we were all pretty full/stuffed/satisfied by this point. There was really no room for dessert, so we had to walk away from the tempting dessert menu. When we first arrived, it was still pretty early and the restaurant was still quiet. Not only were we greeted by a server, the owner John Blakeley also got to the door and welcomed us. No, not because he knew I was a blogger (he wouldn’t have recognized me the small potato! 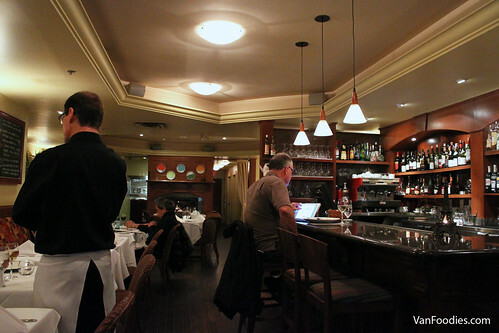 ), it’s just his style to greet all diners as I observed throughout the evening. Then, I heard him speak French with his staff. French speaking staff at a French restaurant?! You can’t go wrong with that! One thing to point out, is that after we settled the bill we realized we got overcharged for the Duck Duo. It’s listed as $30 on the menu, inside the restaurant or posted at the door or even online, but our bill appeared to cost $32. They probably have increased the price but forgot to update their menus, but I would suggest you to check over the bill just to make sure. 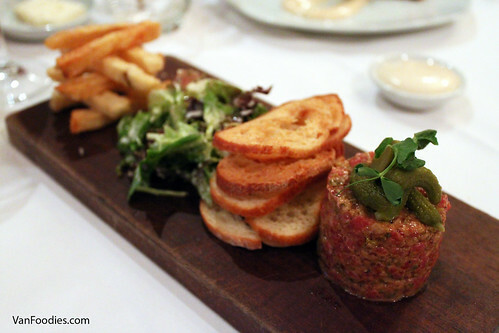 At first, I thought the menu was on the pricey side with entrees averaging $31-32 each, but considering the portion size, it’s actually decent value for your money. And the flavours were just outstanding! Excellent execution on a classic menu. It’s been awhile since we’ve had such a satisfying dinner – it’s like having comfort food at a fine dining restaurant. I would definitely go back again. The pictures look phenomenal. 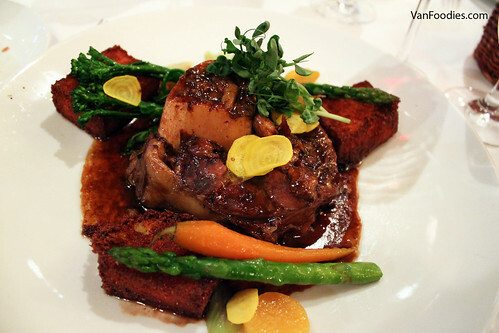 Your description of the Veal Osso Bucco is making my mouth water (literally). Thanks again for your review.